Q: Carrie’s trying to figure out how she fits in as a traditional wife and those roles. In your own life, in what ways are you traditional? SJP: I’m a very traditional person. I cook, I clean, I do laundry, I do my children’s diapers, I wipe vomit off the floor and all other sorts of things that can come out of small bodies and small children. Q:Who do you identify with most of the four – Carrie, Samantha, Miranda, or Charlotte? SJP: There are things I definitely relate to Miranda and being conflicted about work sometimes and wanting to be all things to all people and missing out on certain things. You know what, that’s like if you’re away and there’s a recital or a science fair and you don’t get back in time or your flight is delayed or it was never gonna happen. It’s a surprisingly awful feeling all day long, but I also think I’m a better parent because I’m a working person. Q: How many costume changes are there? SJP: I think I have about 48. We started off with 60 and I think scenes were cut and scenes didn’t make it. So I think between scenes being cut prior to shooting and us not being able to find a good enough reason to change clothes on camera, which is what I would do if they would let me, I think we end up in high 40s. 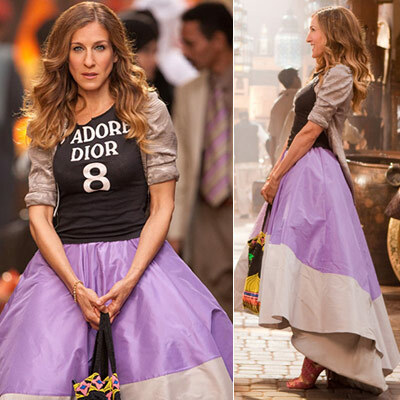 SJP: When Carrie runs into Aidan in the Souk and I’m wearing an old vintage J’Adore Dior T-shirt and the underpinnings of a Zac Posen dress. Not the dress itself, but rather the petticoat… and a pair of Manolos that were made for the movie.